Let’s talk spring sewing, shall we? I haven’t given you a proper introduction to the new Lisette and Little Lisette spring patterns even though they’ve already been released, so I aim to remedy that issue starting right now. We have two new Little Lisette patterns this season, and they’re both designed for part of the market that’s been overlooked a bit. I’ll introduce one today and the other tomorrow. Today’s style is Little Lisette, 1893. I get lots of requests for sewing patterns for older girls, in part because many of you are looking for age-appropriate pre-teen options. Little Lisette 1893 is designed for those older girls. 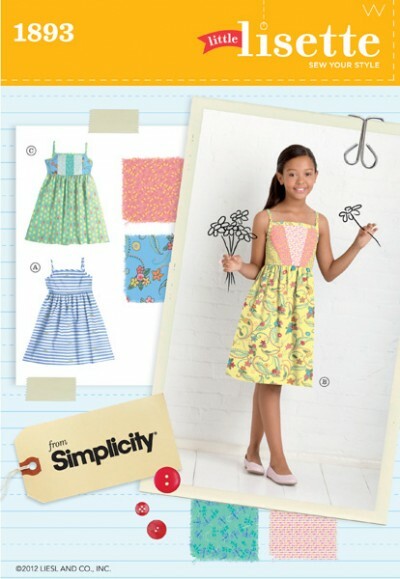 It comes in girls’ sizes 7-16, which means that if your daughter or granddaughter has expressed an interest in learning to sew, this might be a good place to start. Maybe the two of you (or she alone, if she’s feeling ready) could stitch the patchwork bodice. There are two patchwork bodice versions to choose from. One is made of simple strips, and the other (shown above) is a pretty starburst effect. The best part of sewing these jumpers is selecting all the coordinating prints for the patchwork effect and deciding where each print will go. And since the piecing is simple straight seams, it’s completely do-able for a beginner and great way to get their feet wet. At our house the patchwork part is just enough sewing before a certain seven-year-old loses interest (and patience), so once that’s done I take over and finish the jumper. But if you’re working with an older girl the two of you could work together to sew it. Either way, this is a simple style and it allows lots of opportunity for embellishment and personalization. I think the View C (without the patchwork bodice) would be fun to embellish. 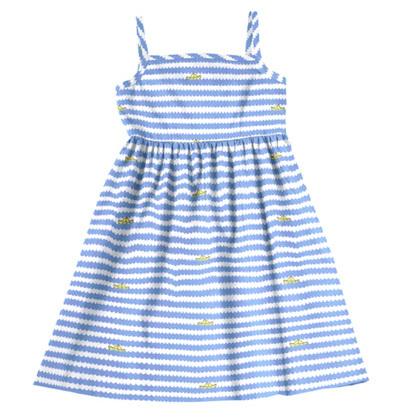 Or just let a single great fabric set the tone, as we did with the paper boat print here. Next up: a mother-daughter dress combination!